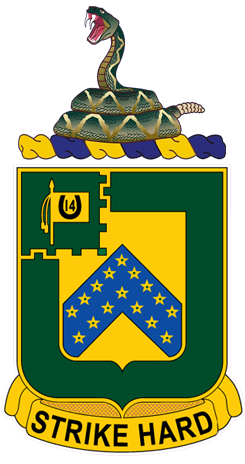 A Gold color metal and enamel device 1 1/8 inches (2.86 cm) in height overall consisting of a shield blazoned: Or a bordure Vert, on a chevron Azure 16 mullets pierced of the field; on a canton embattled (for the 6th Cavalry) Vert (for the 3d Cavalry) a staff erect attached thereto a standard flotant Or charged with a horseshoe, heels upward encircling the Arabic numeral "14" Sable (for the 14th Cavalry). 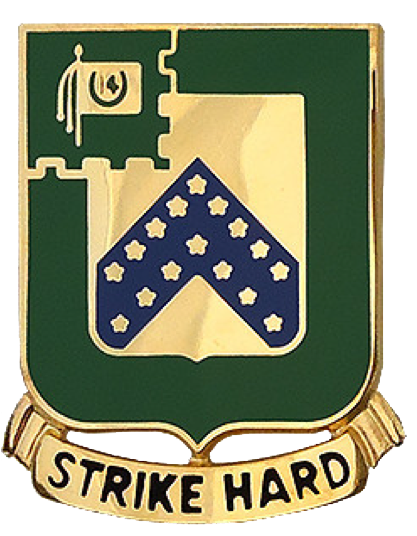 Attached below the shield a Gold scroll inscribed "STRIKE HARD" in Black letters. On a wreath of the colors a rattlesnake coiled to strike Proper. Motto "STRIKE HARD". The regiment was constituted in 1916 and organized with personnel from the 3d, 6th and 14th Cavalry which are shown on the canton. Green was the color of the facings of the Mounted Rifles, now the 3d Cavalry; the embattled partition line commemorates the first engagement of the 6th Cavalry when it assaulted artillery in earthworks at Williamsburg in 1862. The shield is yellow (Or), the Cavalry color; the blue chevron is for the old blue uniform, the 16 mullets (spur rowels) indicating both the numerical designation as well as mounted service. The green border and the rattlesnake crest symbolize the birth and subsequent service of the organization on the Mexican Border. The motto has a direct reference to the crest. The coat of arms was originally approved for the 16th Cavalry on 12 February 1924. It was redesignated for the 16th Cavalry Regiment (Mechanized) on 22 August 1942. It was redesignated for the 16th Cavalry Reconnaissance Squadron, Mechanized, on 5 April 1944. The coat of arms was redesignated for the 16th Cavalry on 28 October 1958. It was amended to correct the symbolism on 23 June 1960. In 1963, the 16th Cavalry was redesignated as the 16th Armor, D Company. 16th Armor was the only active duty unit of the 16th Cavalry. It was redesignated from 16th Armor on 22 August 1968. The coat of arms was redesignated for the 16th Cavalry on 12 May 1970.